At the Agita Mundo technical network meeting on Tuesday, 08.04.14, Vicki Lambert was announced as the newly elected chairwoman of Agita Mundo. Past chairman Brian Martin was elected for another three year term as member of the Executive Board, as was Jasem Ramadan. Eddy Engelsman was thanked for his services as a member of the Executive Board and became member of the Advisory Board. 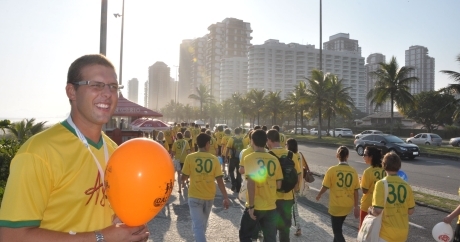 On the same afternoon there was a Agita Mundo Walking Parade with more than 300 participants of the 5th International Congress for Physical Activity and Public Health ICPAPH in Rio de Janeiro. The purpose of Agita Mundo, the Global Physical Activity Promotion Network, is to promote physical activity as a healthy behaviour for people of all ages, nations, and characteristics.